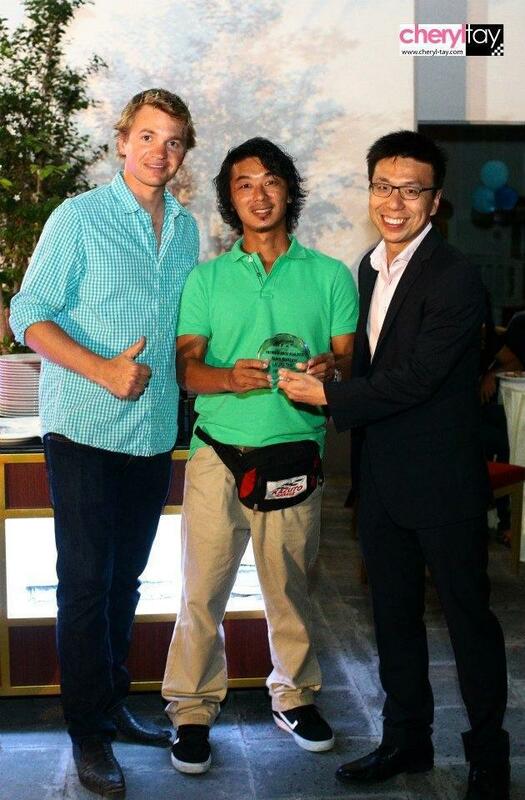 After a good night at the Formula Drift Asia end of year party, which included receiving the ‘Team Manager of the Year’ on behalf of our awesome GT Radial Drift Team Manager, Leo, we headed back to the hotel to get some rest before the big day ahead. Sunday morning came around and after an unusually quick drive we were at the track getting ready for the practice session. We had all the SX2s ready to go and the car prepared when the officials asked us to head out and line up for practice. At this time it was becoming obvious that it was about to rain. Then it did. It started slowly, so we made a couple of adjustments to the car and went to line up. As I got to the grid the heavens well and truly opened. It was torrential! The officials sent us back to the garage before anyone had a chance to get a lap in. We put the car in the garage and did our best to keep everything dry. 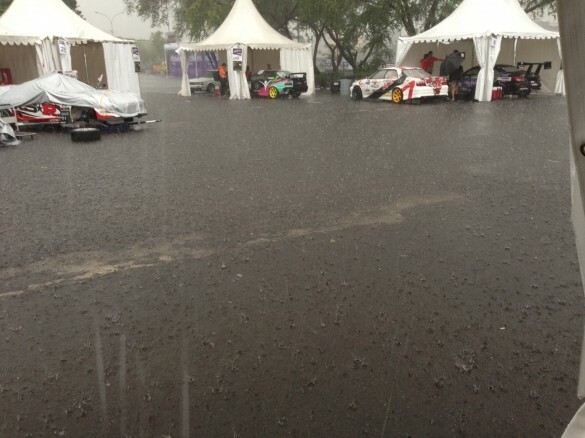 It was not really possible, our pit area backed onto a gutter, and the amount of rain coming down quickly had the water up 2-3 inches. It kept rising to the point of my lapping at my S15’s front bar! 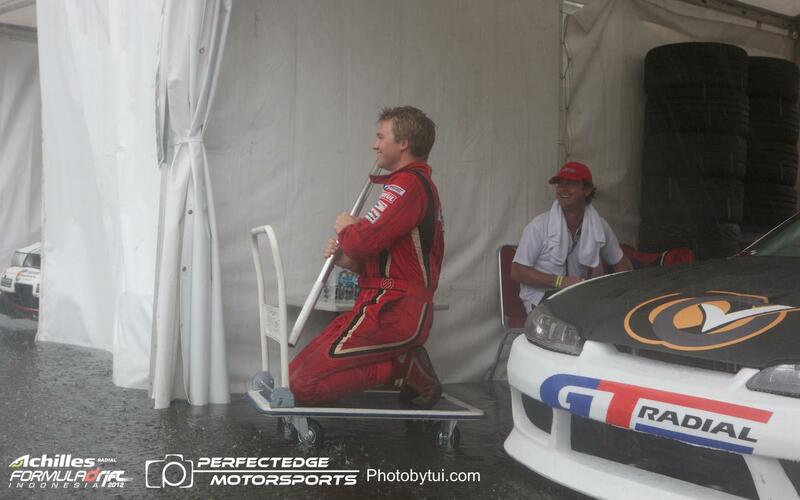 I tried to paddle over to the other garages, but it was a little too wet out there! 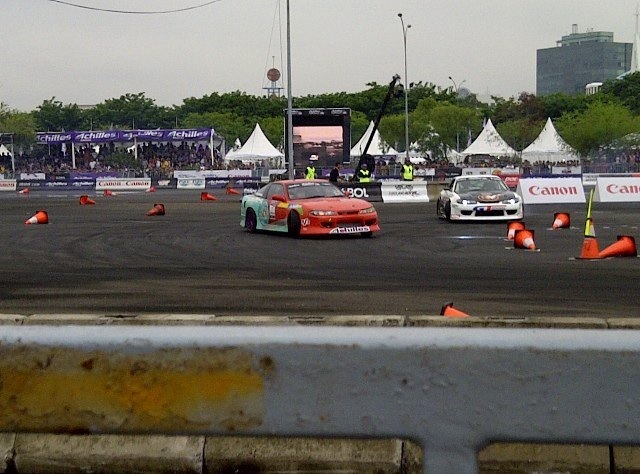 It wasn’t the usual start to such a big day at Formula Drift, so it was interesting to see how people were reacting. 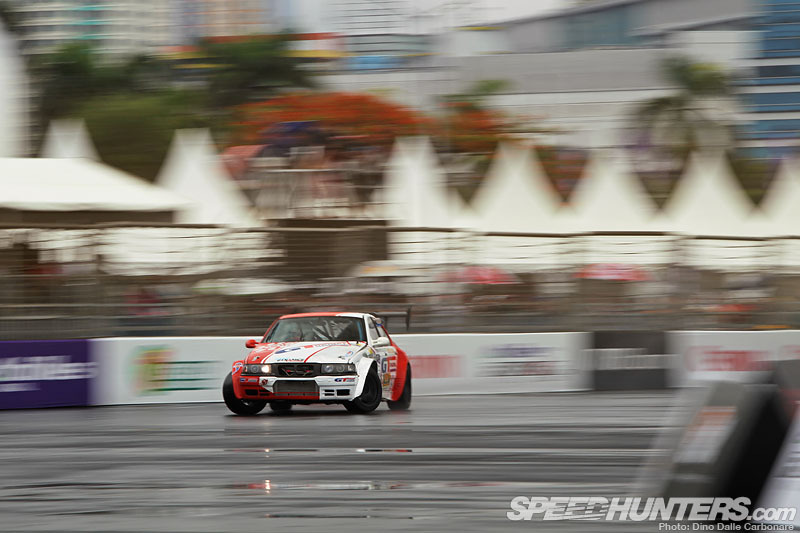 One thing was for sure, the Formula Drift Asia team was not giving in! The last section of the track was under 4-6 inches of water at one stage, so the decision was made to adjust the track. Not something they ever want to do, but today it was the only option to let the show go on. After a meeting with the drivers to explain the slight adjustments to the track, it was time to learn the new track and new conditions. It wasn’t easy with patches that were more slippery than others and walls waiting for you at the outer clipping points, but the new GT Radial SX2 tire worked great in the wet conditions, and we were feeling confident by the end of the session. With rain predicted for the rest of the day, we thought we knew the plan. Qualifying 5th gave us a bye through to the top 32, so we just waited for the top 16 intro’s. But watched the conditions carefully as the top 32 battles were fought out. Then it dried out before the top 16! We went out for the top 16 introduction, threw out some GT Radial shirts to the crowd and checked out the track before my battle against ‘Bimo’. We lined up for our battle and I stuck to the plan, take it easy on the lead run with the unpredictable track in mind and keep it clean. I finished the lap and found that ‘Bimo’ had made an error behind me. On the chase run I stayed close enough, but kept it safe again and we got the win. We were through to the top 8! The next battle was not going to be easy in perfect conditions. 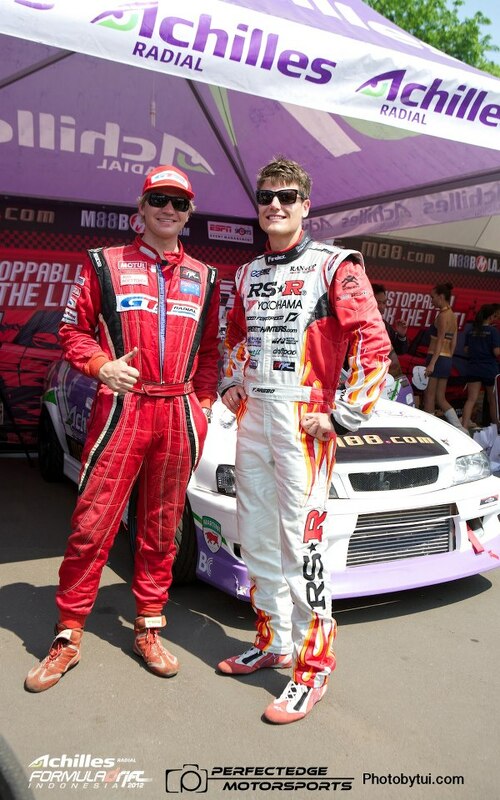 We were up against Fredric Aasbo in the RSR Supra. Fredric is a very experienced full time Formula Drift USA driver from Norway, and a friendly guy with a big vision for growing the sport of drifting. Although this was his first weekend in the car, he was looking very comfortable and the RSR supra is always a car to watch out for. Just before it was time for our battle, it started raining again! Enough to properly wet the track and make the first corner once again, rather unpredictable. I watched the others compete as the track got more and more wet to have the best chance of knowing the conditions when we lined up. As we took off for the first run Fredric pulled away a bit more than I planned on. As we entered the first corner I charged up beside him and quickly closed the gap. I was able to stay close for the rest of the run and finish out the run there. On my lead run Fredric stayed close on the run up and entered the first corner right beside me. I threw out as much angle and the best line I could and was able to pull away slightly through the course. He managed to stay in touch with me, kept it clean and finished the run holding good proximity. We waited for the judges decision. Eventually it came through, and it was Fredric that got the win. I later found out it was a close call with one of the three judges calling a re-run. With the challenging conditions and world class competition, we had done very well to finish the event in 5th place. 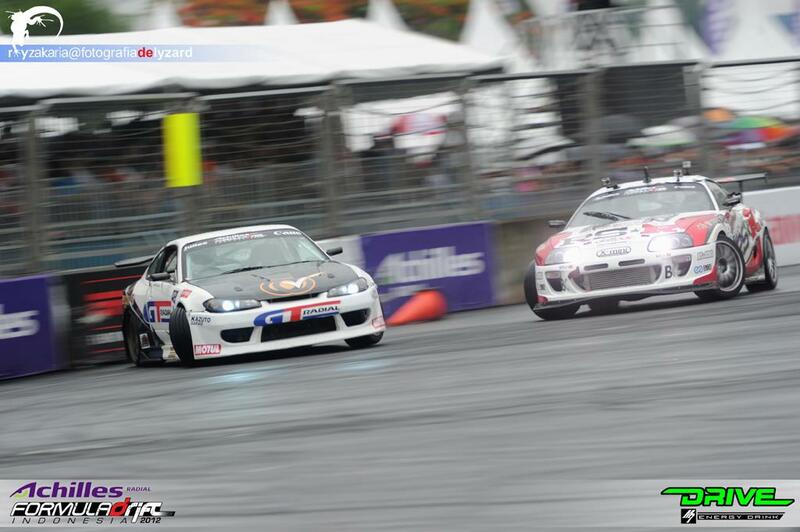 It was great to finish the season with my best result yet in a Formula Drift event! A huge thank you of course goes to GT Radial for making this all possible, and for developing the awesome new SX2 tire! I can’t wait to spend more time testing it! Also, a big thank you to Tyreright Australia, Motul, AutoXtreme, East Coast Traffic Control, TPR Media, Ian Boettcher Race Parts and my amazing crew of Daniel, Gavin and Aaron your efforts are why I can compete at this level, so thank you all! I am super excited about what next year season will bring! We plan to go bigger and BETTER! There are still more events to come this year, so stay tuned and as always, STAY SIDEWAYS!